This is the third in a collection of stories taking place in the world of my fantasy novels! Terin and the gang from Arch Enemies and The Axes of Evil are featured in the main story. Honor Battle by Michael A. Ventrella: Terin’s decision to impersonate a poor farmer boy who has to participate in “trial by combat” backfires in more ways than one as he finds himself facing a familiar foe he can only beat through cunning and wit. The Mystery of the Dead Cat in the Darkness by Bernie Mojzes: When the dead cat nailed to her door comes to life, bites her, infects her, and then runs off, Marin knows today will not be a normal day. Dragon 142 by KT Pinto: The oddball quest of some ragtag adventurers is viewed through the eyes of a straight laced, haughty, smarter-than-thou gryphon. Take Care on the Farfin by Jon Cory: On a deserted beach, a sellsword knight, a spotted dwarf and a beautiful elf discover that than there are worse things than being marooned. A Matter of Death and Life by Mark Mensch: Even a cunning rogue like city-born Nigel Peaks has trouble from time to time and needs the help of a kind stranger to get out of a not-quite-dead woods. The Dragon in the Kettle by Christine L. Hardy: Dragons are extinct, right? And if they did exist, they’d be terribly dangerous and illegal to own as well? So what is a poor blacksmith to do when she discovers that she has helped a baby dragon hatch in her own smithy? Curso and the Passing Tree by Roy C. Booth and Brian Woods: Curso the hobling is helping a loved one prepare for his final hour, but there are creatures in the woods who will do everything to prevent a peaceful passing. Blinded by Laurel Anne Hill: A young man whose only job is to be the official caretaker of mystical fish encounters a mysterious woman, a ruthless necromancer and life-threatening danger of the kind he’s never seen before. The Life and Death and Life of Beryl Truesword by Derek Beebe: Beryl Truesword traveled to the other side of the world to defeat an evil dictator, but how can she kill someone who can foresee the death of anyone and tell the future? Shiny Savior by Shane Porteous: An unusual goblin discovers why sometimes it is better to follow your stomach instead of your curiosity. The Ungrateful Undead by Beth W. Patterson: What happens when zombies retain a shred of their consciousness and are forced to perform against their will? Jump Back into the Fight by Tera Fulbright: A group of unlikely adventurers spend an introspective, long, rainy night, then rise with the sun to face their fears. The Twisted Forest by Angela Pritchett: A brave woman must face a group of evil gnomes to save one of her elven wards who has been kidnapped into the Tainted Forest. Unscarred by Mike Strauss: How can a simple alchemist, untrained in combat, survive a brutal and deadly coming-of-age ceremony? 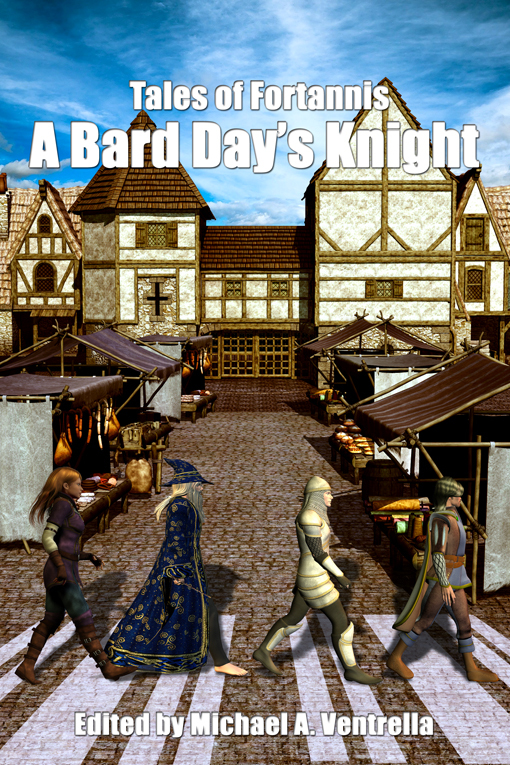 “A Bard Day’s Knight is the third anthology of stories in Michael Ventrella’s world of Fortannis, a fantasy world that is both clearly part of the high fantasy tradition in its general makeup, but incorporates Ventrella’s own touch to make it a much more living world, with its own traditions, a broad assortment of inhabitants ranging from furry, catlike gorbe to the more familiar humans, elves, and dwarves – though even the most familiar will have their own unique twists to offer. Though the title is humorous, readers shouldn’t be fooled into thinking that this is parody or comedy; while many stories have a lighthearted touch to them, others do not, and almost all of them have strongly serious elements. 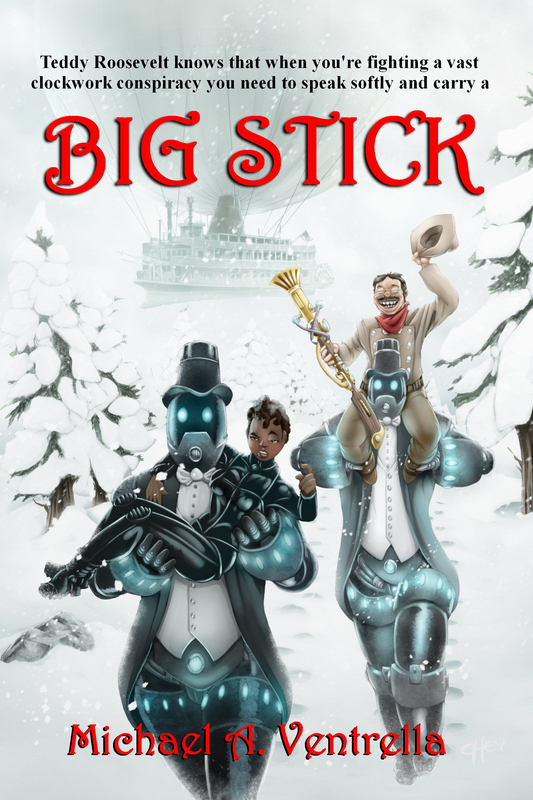 The fourteen stories in this anthology compare, overall, very well with those in the prior anthologies; this is, in fact, the strongest of the three, with only one story that I felt was overall a weak tale, and the others ranging from quite good to brilliant. What is really fascinating about an anthology like this is seeing what the world of Fortannis looks like through eyes with so many different perspectives. Old familiar friends are here – Ventrella’s own squires Terin and Darlissa, Curso Brambletoes the clever, subtle hobling, exiled sellsword Sarlon and his companions Minnow and Mumblepeg – and new ones, including a unique view of the life of a rather unusual Goblin in “Shiny Savior”, the eponymous and clever hero of “The Life and Death of Beryl Truesword”, Brenlund in “Blinded” who has to overcome his preconceptions to save both himself and others from a terrible fate. Most of the stories have strong voices – the characters that must drive the story quickly define themselves, telling us who they are and why they matter, whether they are noble, poor, human, goblin, warrior or sorceror – and the challenges they overcome loom large within the stories, whether they are threats to many or merely the problem of day-to-day survival. “The Beatles reference in the title, as well as the ‘Abbey Road’ positioning of the characters cracked me up. This is a collection of fantasy short stories that are of a pretty standard archetypal nature. They all take place in a ‘shared world’ setting of Fortannis. This is my first visit to Fortannis, but this collection concept reminded me both of the ‘Myth’ books, by Robert Asprin, as well as the ‘Hell’ series edited by Janet Morris.